Recipes used to be something we treasured; passed down through families, through friends, a small piece of oneself being shared with each scribbled card sent out into the world. And each card became a sort of diary, a chronicle of what was happening over the years. The stain from when someone knocked coffee over on it, the phone number jotted on the back when you couldn’t find anything else to write on. The perfect start to any morning. These little cards, quietly, reminded us of something, of someone, of somewhere. Each time we pulled them from the recipe box, if only for a second, and perhaps without even realizing it, we were transported. The irony is not lost on me that I am writing a blog post about the dying art of recipes, and yet there seemed to be nothing else to say when it comes to this Sour Cream Coffee Cake. This recipe has been in my family for years, still no one seems to remember where it came from. It sits on a faded piece of white paper in my Mother’s recipe box, wedged in “Cakes”, or perhaps misplaced in “Breakfasts” or “Pastries”. A light dusting of flour seems to coat nearly everything in the recipe box, which in and of itself feels like an adventure worth exploring. Enjoy it warm with coffee…don’t worry, no one will notice you went back for seconds. Be glad you stumbled upon this Sour Cream Coffee Cake whose simplicity beguiles its deliciousness and beauty. It is the perfect addition to any Sunday brunch, and besides its long cooking time can be quickly assembled, popped in the oven, and forgotten about. Particularly delicious when served warm with coffee. It feels like a little slice of home if you ask me. Thanks to the sour cream this cake is unbelievably moist and delicious. Preheat oven to 325. Grease well a tall cake pan, such as a bundt pan or spring form pan. Cream the sugar, vanilla, and butter and fluffy. Add in the three eggs, one at a time. Add in the flour, baking power, baking soda, and mix together well. Pour half the mixture into prepared pan and smooth out with a spatula. In a separate bowl combine the walnuts, cinnamon, and brown sugar. Sprinkle half on the batter. Pour rest of batter into pan, and sprinkle top with remaining half of sugar mixture. Bake 1 hour, or until cake pin inserted comes out clean. Let rest for 5 minutes before removing from pan. Can I have a slice , please. Why yes you can Albert…you just have to whip up one really quick! I love this post! You are so right. My great grandmother was an amazing cook and had all these special recipes and tricks she used. This is what my mom tells me…my great grandmother passed away when I was very very little but I always wished she had left behind some of those incredible recipes so I could learn more about her and have something to pass down when I have kids. Yes, somehow the recipes are more special I think when you know the history behind them. Lucky for your family, now they’re able to get recipes from you! 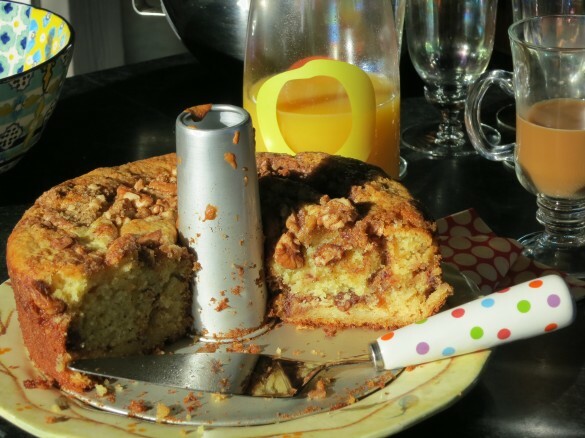 There’s nothing I love more than a good sour cream coffee cake – I am SO making this soon! Thanks for sharing your family recipe! It’s very NY, isn’t it Katherine? Did you ever stop at the Rein’s Deli in CT? They had a great coffee cake. This coffee cake is great. Here is one I made http://savorthefood.wordpress.com/2012/12/19/chocolate-mexican-coffee-cake/. So true Erina. I love that almost every family has a Sour Cream Coffee Cake recipe floating around! My mom makes one that is epic. She will never let me share her secret recipes so no chance of me blogging them but I’ll have to whip one up when you guys come over. Yes please!! I would love to try that even if you won’t spill the beans on how to make it! I adore Sour Cream Coffee Cake and my mom makes an amazing one. How is it that every family has a recipe? I love that tidbit. Also love stained, flour-dusted recipe cards that carry so many memories. Your photos are making my tummy rumble…what a beautiful cake! Thank you Hannah! 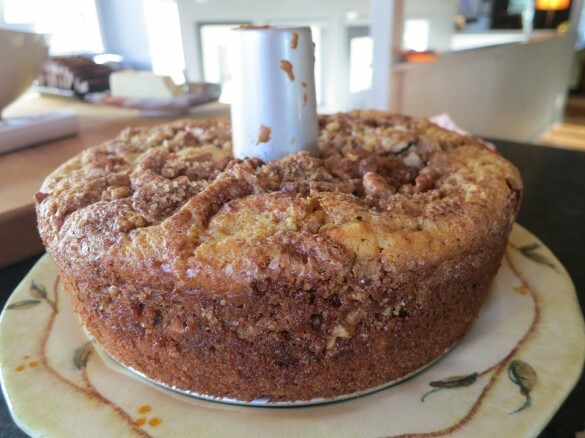 Perhaps we’ll all need to have a Sour Cream Coffee Cake party. Try them all! I find old recipes boxes to be endlessly fascinating! And as for this sour cream coffee cake, it sounds perfect right about now. I do too, Christie. I can literally sit at my mom’s counter and just dig through hers for hours! I’ve never had sour cream coffee cake before in my life! Wow it looks so delish – love that it looks moist (some coffee cake like from starbucks etc are not so good). Saving this recipe and I need to buy sour cream! That’s the trick Nami…it is so moist. And because you can really whip the eggs and butter before putting in the flour, it is tremendously light and fluffy as well. Give it a try! Low fat sour cream is fine too if you like. I love my old Hand written recipes, and I love getting out the book they are all stuffed in because they do bring back such fond memories. Thanks Meghan…what are some of your favorite old hand written recipes? I also use the hand written ones for mama’s cheese sauce which is the base for my mac and cheese now, and I always use the recipes for dill dip and artichokes. My recipe book is looking old and worn, but I’ll keep it forever. PS. I nominated you for a blog award because I love your writing, your recipes and your photos. Thanks for producing such a quality blog. I really enjoy it. Wow….thank you! That is amazing…so appreciate it! I hadn’t made one in years either, Eileen, and then I found my mom’s old recipe and had to have it. This one is easy! Thanks! The sour cream is definitely the key ingredient…moist, that perfect combination of savory and sweet, but not too heavy. So good! Thanks for stopping by! Wow, this looks squidgy and amazing. As soon as I get a bundt pan, I’m making this beauty! Thanks Ann! True confessions: I don’t have a bundt pan either. First time I borrowed my sister-in-laws, and second time I used my Aunt’s spring form pan. Guess I know what’s going on the list for Kitchen Supplies! Wow, this sour cream coffee cake looks divine. I can tell why you always make it. Hm….I start to puzzle on where it’s from too. But maybe it’s so good that it’s been passed from from many many generations above so it lost track? I think that’s quite possible. Anyhow, you should keep it going and pass along. I can’t wait to make this cake! Thanks Amy! I’m eager to hear what you think of it. Love these old family recipes that just keep going and going. I’m must be sleeping on the job again… how did I miss this one?! Actually I think I had the flu and was oblivious to whatever was going on in the world that week. I LOVE coffee cake. Making this! Thanks Karista! I don’t know what it is lately but I have a crazy sweet tooth! This coffee cake was a good middle ground. I love old family recipes and thumbing through boxes of recipe cards. Thanks for sharing this wonderful cake! You are so welcome. Even if they’re not better, the family recipes somehow always seem more special. Old recipes, handwritten and passed down after being tested a million times, are a treasure. 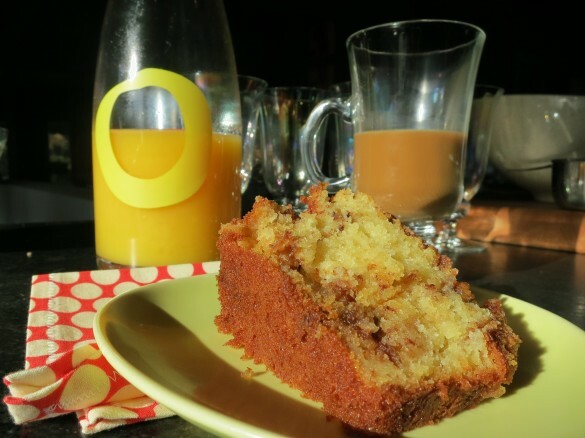 And a good coffee cake recipe is always welcome. This cake looks sooo good! I think you just hit on the crucial part. These tried and tested recipes are just that…proven and bulletproof. It’s a nice balance to all the new recipe writing and development that we all do nowadays.